I have been on here for a while and finally doing one of these. I bought a use 2007 Maxima last September. It is an SE with Bose no navi. It had 48,498mi on it. now it has 53,621. E&G classics Fine Mesh Grille. My slip and VDC lights came on and that needs to be fixed. The rear bumper that is on the car is not the right one and I have to fix that. My fog lights need rewiring as the harness is damaged on the right side. Got some rust on my oil pan. That is going to need fixing soon. I got a bad ballasts on the right side. Splash guards needs to be replaced. Air filter needs to be replaced or cleaned. I have PIAA crystal ion yellow fogs instilled. I bought CBI's and yellow turns and cornering lights. not amber; yellow! I have 2 Matsushita Gen V Ballasts from TRS. The ballasts, yellow bulbs and CBI's going in soon. I Bought a willwood kit. Gonna buy willwood pads and SS lines. Rear Sway Bar, Front Strut Bar and Racing Line Front/Rear End links. EBay cat back with Maganaflow 10436 and 14807's. I would like custom pipes but price will dictate which I get. IPCW tail lights. someone on here said they would sell me there's.. not so far. you know who you are. In the Ultimate Suspension Upgrades thread is the Altima SE-R Sway bar in stage 2 and 3 the same nismo sway bar in stage 1? without springs how much of an improvement can i really expect? Installed one ballast some time ago. Had a loose dust cap and water got into the ballast. Changed out the inner fender liner on that side as well. Last edited by incubus0111; 06-16-2016 at 02:05 AM. I like it. But it will look 100 x better with a drop imo, if your worried about it being to low get coilovers and adjust how high, low, soft, stiff you want and have great handling. Nice . But i like the MMR wheels better. The rays look to small for the max. 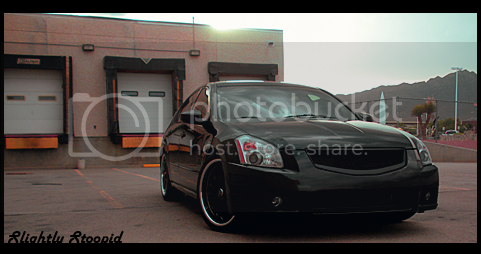 IMO... maybe with a drop it will look better..
Im lowered on teins and kyb with rl strut bar. All this has helped. But my max ain't no sport car. She still a boat around corners. Last edited by silvermax06; 04-07-2013 at 12:46 PM. Welcome is your car blue? I think I seen it for sale a while back when I was looking for a maxima in Houston. I did not know coilovers let you adjust height. i thought it was just stiffness. I know it will look better with a drop but cant and wont do it. The roads here will destroy the car. I already take it easy on the bad areas and people get all mad in their trucks. Got a big ol dent in one of the mufflers already. Yea i do somewhat as well. The MMR are too heavy though. In my book form has to follow function. The rays make the car feel better. Yes its blue. Did you test drive it? No I didn't but Im guessing is the same one lol. Lowering is not to bad here in Houston I lowered mine and just gotta be kinda careful. I know which ways to take to avoid scraping and potholes in my usual drives. my regular drive around Pasadena is fine. i just piss everyone off by going slow. i went to fogo de chao on Westminster on Friday and i don't know what is going on over there but the roads are terrible. looking back to our last vacation. we had the car loaded up pretty good. thinking about the maxima loaded up like that bottoming out all the way to concan. no fun.. no fun at all. you got to take what you can get. lowering is not practical for me at this time. the willwood's will look great under the rays. got my eye on some nice alien rotors that will look great. got some nice yellow fogs. the injen howls. the magnaflow's will complete the look and sound. i keep the car clean and the dings can only be seen up close lol. i also want to change my grille to a cmod-esk grille. i am not sure what would go in the bottom part though. I like your taste man. With Coilovers I believe your can adjust close to stock height and have a nice handling car. Still handle better lower though.. Someone correct me if I'm wrong. Thank you. i will look into coilovers, however in the comfort vs handling battle i have to go with comfort. KYB shocks i can deal with and choose handling there. the max with 19s is rough already. My BUILD/MAINTENANCE thread. Aiming for 250K on odometer. My brother-in-law and family live in Pasadena so we make the trip every 3-6mo. It's a family trip though, so we usually have extra passengers and rude in the "family-assault vehicle." I've always loved those Nismos, good call man. Got 350z calipers on the way. Wilwoods waiting here to go in. The wilwood calipers are black what color should i paint the 350z calipers. red, blue, gold or black? going to put Nissan decals on them as well. yea i think i will paint them black and have the decal be silver. going to have to hunt down the wilwood rears at some point. Gonna go HID if i can't resolve my right side fog wiring. Looks good. I've always liked the traditional yellow for fogs. I agree the fog lights look good. Thanks guys. You can see that the left side is brighter. The right side is taped into the left. When i drop the bumper to install the new bulbs and ballasts i will see whats going on there. All in all though i want it brighter and more yellow..
i will do HID and yellow film as well. The day has come at last. Here it is my first major mod / upkeep. I got my BBK installed finally after many months. Review: OMG! What i had before were not brakes... lol.. I had the work done at ASAA Racing. If you live in houston that's the place to go. Real nice environment and the guys are cool and know their stuff. The bad part: My rear brakes are still stock. I planned on having the 350Z rears but i fucked up. I did the required reading but i still failed.. The calipers i got and painted all nice did not mount up. The stock calipers did not clear the rotors i bought .. i need to get my invoices and see where i made the mistake. Moving forward: The shocks took about an hour to settle back down after being fully extended. That tells me what i need to do next. Looks great! Save up and use coilivers once you get your next mod. Love those wheels! So says latinmaxima, so it shall be! If i ever do coilovers it wont be any time soon. Next up is shocks, endlinks and sway bar. Then i got to do something with these mufflers i bought..